The Way I See It: Are we safe from the Ebola outbreak? Those infected are coming to the United States. In 1994, a non-fiction book published by author Richard Preston hit the stands. The thriller, titled The Hot Zone, reported a highly infectious, deadly virus from the central African rain forest suddenly appearing in the suburbs of Washington, D.C. The book speaks of an incident that occurred back in 1989 in which a mutated form of the Ebola virus was discovered at a primate quarantine facility in Reston, Va. Once this was realized at an Army research facility outside the nation's capital, a SWAT team of soldiers and scientists wearing biohazard space suits was organized to stop the outbreak. The grim operation went on in secret for eighteen days, under unprecedented, dangerous conditions. The facility was subsequently torn down sometime in the mid to late '90s. However, the Ebola virus is still very active today. The virus is exceptionally dangerous to humans because it has a high fatality rate, [on average, killing between 50 and 90 percent of its victims] is very infectious, and there's no known treatment or cure. While the book would go on to reach No. 1 on the best-seller list shortly after it hit the stands, I must have read only about ten pages and never looked at it again. The book opens with the lead character, Charles Monet and his visit to a cave during a camping trip to Mount Elgon in Central Africa. Not long after, he begins to suffer from a number of horrific symptoms – described in vivid detail in such a horrifying sequence. He had contracted the disease, and it was the description of his symptoms that put me at such unrest, returning to the story seemed impossible to me. The origins of Ebola go back far before the book was published. The first reported case of the deadly virus came in 1976 and was named after the Ebola River in the Democratic Republic of Congo where it was discovered. At the time, the area where the disease was spotted was officially recognized as Zaire. Since that year, the World Health Organization has kept tight records each time there has been an outbreak of the virus. Many of the outbreaks that occurred were contained in remote parts of West Africa, and aside from the incident that occurred in Reston, no known case of the virus entering the U.S. has been reported. American aid workers – physicians and nurses – have been over in the remote parts of Africa, helping to treat those who have contracted the disease. From April 1 through July 27, this outbreak has infected over 1,300 and taken the lives of 730 individuals – and is still active. 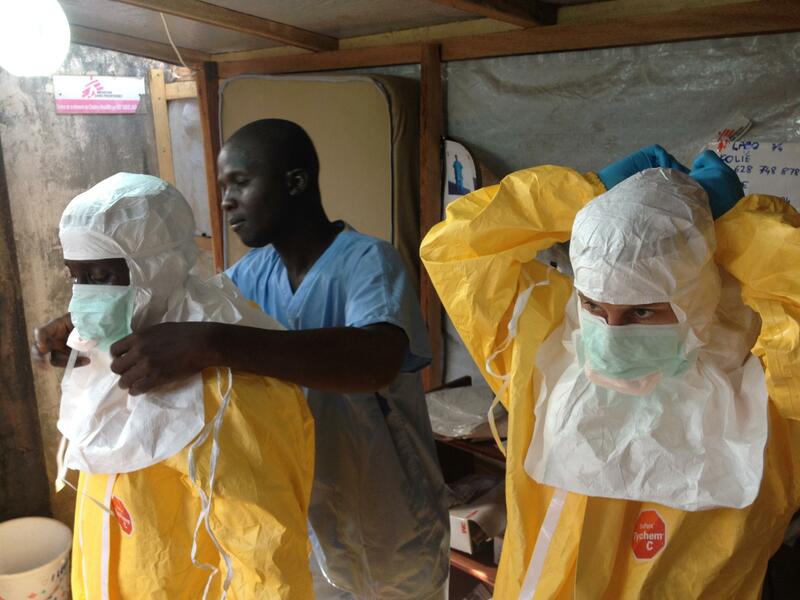 Within the last few weeks, two of the American missionaries that have been abroad fighting the disease now have Ebola. While these individuals have been receiving treatment from afar, it has been determined they would both receive better care at home. Saturday, Aug. 2 one victim, Dr. Kent Brantly, found haven at Emory University Hospital in Atlanta, and the other American is most likely en route – if not already there, by the time of this printing. The hospital houses a specially built isolation unit equipped to treat patients exposed to diseases like this. While many of us are concerned about the disease creating a home base in our nation, the truth is, there is very little cause for alarm. Unlike our perception at times (the ongoing debate about universal healthcare), the U.S. offers a highly developed healthcare system. Even the most basic of hospitals stateside have the capacity to isolate patients simply with an intensive-care unit (ICU) – something we Americans take for granted, that many of our neighboring countries still do not have. And while the disease is highly contagious, it is not airborne; someone would have to come in direct contact with an infected person's blood, secretions, or organs in order to be susceptible to infection. In West Africa, the rapid spread of the virus can be blamed on weak health systems and traditional burial rituals (including washing the bodies of loved ones after death). The individuals being brought here will also be transported via a private medical charter plane outfitted with an isolation pod with doctors and staff that are highly trained in treating and containing the virus. In addition, should someone contract the disease during a flight, the Centers for Disease Control (which happens to also be based in Atlanta) has 20 isolation stations at major airports around the country. These are staffed 24/7 and are fully equipped to deal with such circumstances. In addition, this is not the first time a highly lethal virus like this has surfaced in the U.S. The CDC has stated that there have been five instances in which people came to the United States carrying the Marburg virus and Lassa fever virus, which are in the same family of the Ebola virus. The health system correctly identified the disease in every case, and the virus didn't spread. As for why they're being transported here at all – first and foremost, they are United States citizens who have a right to come home. Of the 729 deaths abroad, 60 of them have been healthcare workers – but none of those have been Americans. Our aid agencies apply stringent precautions for all healthcare personnel – and have never lost members of their teams to Ebola. And I'm sure they don't want to start now. Markedly, back at home, there's a far better chance of survival. Even though there's no known cure or treatment, our facilities are far better equipped with the latest equipment and techniques. Is it unsettling? Yes. However in the end, it is in our best interest to not have our irrational fears trump our far-reaching compassion for others, especially when it comes to taking care of our own.